The Murray State football team took over sole possession of first place in the OVC Saturday with a 34-6 win at Eastern Kentucky, paired with a loss by fifth-ranked Jacksonville State. The Racers struggled early in the game, running just 12 plays through one and half quarters and only picking up one first down during the span. However, when Quincy Williams intercepted the ball with under four minutes left in the half and returned it 85 yards to the one-yard line, the momentum immediately shifted towards the Racers. After Rodney Castille punched it in for MSU from the one-yard line on the next play, the Racers would go on to outscore the Colonels, 31-3, and never look back. 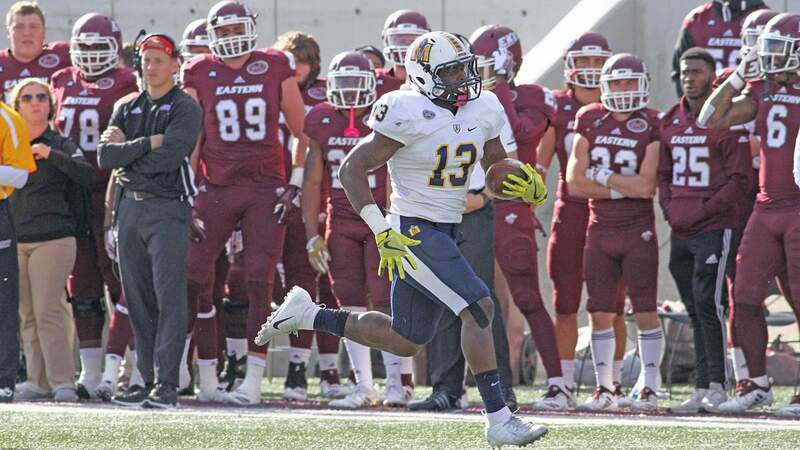 The Racers passed for 208 yards in the game and rushed for an additional 121. Drew Anderson was 20-for-30 for 205 yards and two touchdowns in the game, while James Sappington led the receivers with three catches for 42 yards and one touchdown. Rodney Castille rushed for 50 yards and one touchdown in the game, while Jared McCray added 36 yards and a touchdown, the first of his collegiate career. Kenney Wooten had a big game for Murray State defensively, picking up seven tackles with 3.0 sacks, 3.5 tackles-for-loss for a total of 20 yards, two pass breakups and a quarterback hurry. Williams led MSU with 10 tackles in addition to an interception and 0.5 tackles-for-loss, while Sanford had eight tackles, 2.5 for loss and a quarterback hurry. As a whole, the defense held EKU to just 2-for-6 on fourth downs and 2-for-4 in the red zone. The two red zone scores by EKU were only field goals, marking the first time since 2013 that MSU had not given up a touchdown against a FCS opponent. On Saturday, the Racers return to Roy Stewart Stadium for Homecoming 2018 against Jacksonville State. Kickoff on ESPN3 is scheduled for 3 p.m.
To see Quincy Williams interception return (above) click here.